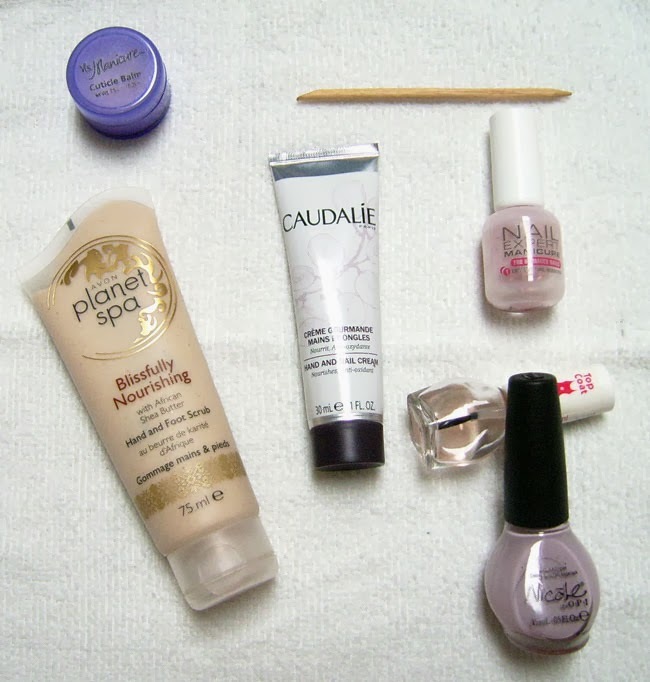 Start with clean nails: Remove the old nail polish with a cotton pad soaked in nail polish remover. Shape your nails: Use a nail clip and/or a nail file to shape your nails. Don't forget to use the nail file in one direction to avoid splitting your nails. At this stage you can use a nail buffer onto your nail plate to create a smooth surface. Exfoliate: Use a hand scrub to exfoliate your hands. Insist around the nails to soften and remove the dead skin. Make your own hand scrub by mixing granulated sugar in your favorite liquid hand soap. Hydrate: Apply a good hydrating hand cream on your hands, and around the nails apply a cuticle balm in a thick layer. Leave it for 20 minutes. For best results, cover your hands in plastic wrap. Perfect cuticles: After 20 minutes your cuticles should be very soft and easy to remove with an orange stick. Try to avoid cutting them because they protect your nails from bacteria. Degrease: Remove the cream and cuticle balm from your nails with a cotton swab soaked in nail polish remover. If you want your nail polish to adhere, don't skip this step. Protect your nails: Apply 1 coat of nail polish base coat to protect your nails from staining and chipping. Effect: Apply 2 coats of nail polish in your favorite color. Shiny nails: If you want to protect your manicure from chipping and to add extra shine to your nail polish, apply 1 coat of nail polish top coat. For best results, wait at least 5 minutes between each coat. Voilà: Clean up any mistakes on the edges with a nail polish remover pen or with a cotton swab soaked in nail polish remover. This is actually so helpful! ps, I love your header!